"At the center of every story is some question I do not have the answer for, and something that really scares me." 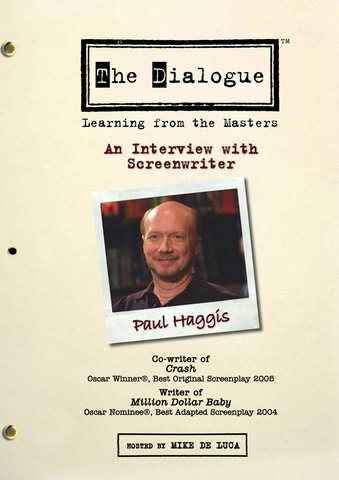 Acclaimed writer-director Paul Haggis has been a fixture of television and film for over 25 years. In this wide-ranging interview, the Oscar®-winning co-screenwriter, director, and producer of Crash (Best Picture 2005) discusses a three-decade career that led from writing for sitcoms like Diff'rent Strokes and The Facts of Life to his breakthrough screenplay for Oscar®-winning director Clint Eastwood, Million Dollar Baby (Best Picture 2004). Haggis's matter-of-fact stories of navigating the entertainment industry are an indelible primer for how to manage the screenwriting life, make a successful transition from TV to film, develop a strong story and characters, pitch an idea, and surmount Hollywood's more frustrating obstacles.